On Saturday 12th May there was a performance of Julien Chilcott-Monk's setting of Blessed John Henry Newman's "Dream of Gerontius". 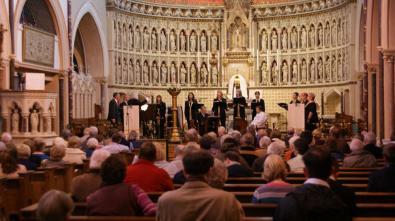 "Vox Angelica" performed the choral parts, accompanied by an exotic assortment of percussion. 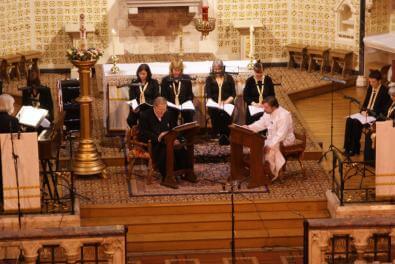 Robert Hardy read the part of the Soul, with Neil Nesbit playing the Guardian Angel. Newman's poem tells the story of Gerontius, who is in his last agony and is then conveyed by his angel to judgement, before willingly being taken away to be purified in Purgatory. One of the nineteenth century's greatest religious works, a copy was found on the person of General Gordon at his death. The work emphasizes the justice and majesty of God, but still more His mercy in cleansing us of sin in Purgatory. Julien Chilcott-Monk's music contains many references to Gregorian chant and brought out the passing of time, which leads us to judgement. 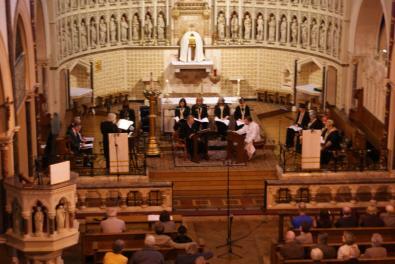 The performance raised over £1,000 for our "Reaffirmation and Renewal" Campaign.